Provide your customers with the version of the terms of sale that they accepted. 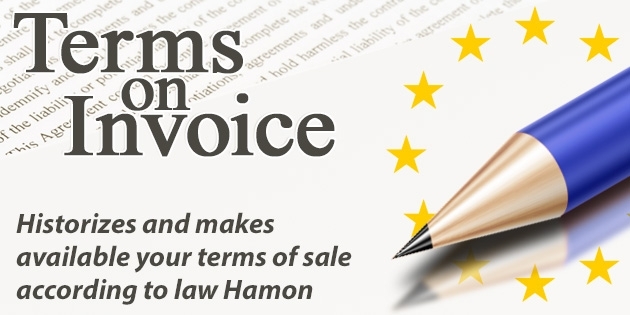 Our PrestaShop addon Hamon Law - Terms on invoice module allows your customers to be provided with the version of the terms of sale that they accepted when making their purchase, ensuring your compliance with the European Directive on Consumer Rights, known in France as the Hamon Law. All sales made from your site prior to June 13, 2014, will remain subject to the earlier legislation. It is therefore extremely important to retain a version of your current terms of sale and to avoid making the changes directly in your content management system. Future updates to your terms of sale should also remain available for consultation by customers who accept them. An e-mail or a paper confirmation would meet the legal definition of a permanent form and fulfil the aims of the legislation, which are to ensure that relevant information is available after the order has been completed. Our recommendation is to make use of e-mail confirmation wherever possible. The law requires that information should be provided “within a reasonable period.” Given that e-mail confirmation of an order can be sent instantaneously and automatically within PrestaShop, it seems “reasonable” to supply the required information by e-mail as soon as an order is placed. Moreover, detailed confirmation by e-mail reassures customers that their orders have been received on the agreed terms. Limit the number of e-mails per transaction. To avoid overwhelming your customers with e-mails following their orders, we have incorporated the terms of sale on the reverse of your invoices. These invoices are provided in the PDF format as an attachment to the order confirmation e-mail. In addition, customers who have lost their e-mail confirmation and/or their invoice will have the option to download their invoice from their customer account area, which will also contain the terms of sale that were in force at the time of their purchase. Total: 29,99 € tax excl.